Charles de Gaulle Airport, also known as Roissy Airport, is named after Charles de Gaulle, the former French president who led the Free French Forces during World War II. Charles de Gaulle Airport was originally known as Aéroport de Paris Nord but was renamed to its current name in 1974, after vast reconstruction, making it one of the most modern airports worldwide. Charles de Gaulle Airport (IATA code: CDG) is the largest international airport in France and the hub airport of Air France. Flights to Charles de Gaulle Airport can be reached by international airlines such as South African Airways, Emirates and Turkish Airlines. CDG is a 40-minute drive or a 20-minute train ride from the city centre of Paris. Book your cheap flights to and from Charles de Gaulle Airport online! Charles de Gaulle Airport, situated in Paris, is one of the busiest airports in the world. Renowned for its humungous size, Charles de Gaulle can become a little confusing, with its 3 terminals being broken up into smaller terminals, operated by various airlines. Charles de Gaulle sees over 60 million people passing through its doors annually. It is a key entry point for travelling the world. Compare and book your cheap flights to Charles de Gaulle Airport with Air France and popular flight routes from Johannesburg to Paris and Cape Town to Paris. Shops at Charles de Gaulle are sure to send you on a whirlwind of fun. It is abundant with incredible shopping opportunities. Along with duty-free shopping, travellers can purchase anything from the likes of cosmetics, wines, accessories, tobacco, clothing and jewellery. Charles de Gaulle has an amazing range of food and drink options. Be sure to indulge in the Parisian treats being offered throughout the CDG terminals. A French gastronomy can be encountered at restaurants, bars, cafés, restaurants and fast food shops. 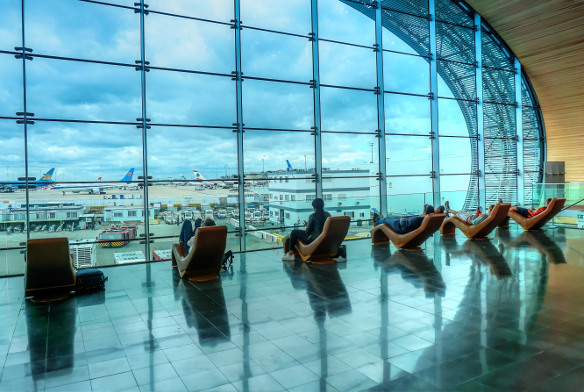 The Charles de Gaulle international departures terminal has phenomenally luxurious lounges for travellers on Air France, Air Canada, American Airlines, Cathay Pacific and Emirates. Charles de Gaulle has an impeccable range of facilities, including post offices, medical centres and emergency services, pharmacies, places of worship and a ‘convenience’ store. This 3-star hotel is a cozy way to relax in between seeing Paris’ attractions. It is a 10-minute drive from Charles de Gaulle Airport. Amenities include free Wi-Fi, parking, airport shuttle and a restaurant. This modern hotel is located between the CDG terminals. It is a 13-minute walk from the 1 RER station (subway train). Amenities include an indoor pool, a restaurant, laundry service, free Wi-Fi in public areas and airport shuttle. Ideal for business trips or family vacations, the Merchure Paris CDG Airport & Convention hotel is a stylish and elegant retreat. It is a 10-minute drive from Charles de Gaulle Airport. Amenities include parking, a restaurant and bar, Wi-Fi, business centre, a gym and an indoor heated pool. Foreign exchange can be ordered online up to 60 days in advance of collection date. Orders can only be collected by the person named on the order form. Travelex outlets can be found in the Terminal 1, 2 and 3. Charles de Gaulle Airport has expansive parking options, including long-term, short-term parking, covered parking and open air. There are parking companies who will assist you with discounted parking prices. Visit Charles de Gaulle for parking information. Charles de Gaulle is located 25 km northeast of the city centre of Paris. There are various transportation options available, including metered taxis, trains, buses, airport shuttles, Uber and car hire options.